Land management practices in the Trans Pecos are not favorable to some upland game species. For example, bobwhites are scarce throughout this region. Scaled quail numbers fluctuate tremendously. Some blame it on lack of rainfall. Some blame it on coyotes and raccoons. Others blame it on feral hogs and skunks. While research has indicated that these factors affect nesting activity to some degree, no research has yet to show that any of these factors are limiting population viability. The truth is... quail can't thrive where they can't nest. The number one limiting factor to quail in the Trans Pecos is lack of suitable nesting cover. Quail need bunchgrasses ( little bluestem is one example) in which to produce successful nests. This critical habitat component is absent throughout much of the Trans Pecos. Properties under a sound range and wildlife management program host decent quail populations. The species of West Texas quail found to be the most tolerant of hot, dry conditions is the Gambels quail. The best Gambels habitat has a mixture of mesquite, Apache plume, catclaw, and four-wing saltbush. Gambels quail hens lay 9-15 eggs in a shallow depression in the shade of a shrub or similar vegetation. These eggs hatch in about 22 days. 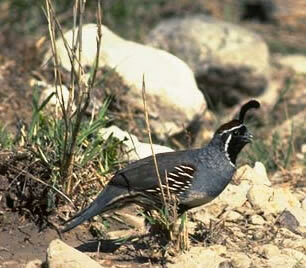 Besides the Gambels quail pictured above, three other species of quail occur in the Trans Pecos. They are known by many names. Scaled quail (Callipepla squamata) also known as blue quail, blues, cottontops, and scalies. Scaled quail occur throughout the Chihuahuan desert and are the most common quail in the Trans Pecos. Adapted to the desert, scaled quail hens scratch out a shallow nest beneath a bush and line it with grass. The normal clutch is 8-12 eggs which hatch in about 22 days. Montezuma quail (Cyrtonyz montezumae) also known as Mearns quail, Harlequin quail, and fools quail can be found in the high desert grasslands of the Davis Mountains and other mountain ranges in the Trans Pecos. These quail are considered specialists in that they inhabit high elevation pine-oak woodlands and depend upon underground tubers and bulbs for both their food and their water. Prefering more grassy areas than scaled quail, Montezuma quail nests are shallow depressions in dense, grassy cover lined with vegetation usually forming a partial dome. The normal clutch is 8-14 eggs hatching in about 26 days. Bobwhite quail (Colinus virginianus) are associated with higher rainfall than normally occurs in the Trans Pecos. Bobwhites occur more commonly east of the Pecos River but do occur in the eastern counties of the Trans Pecos district. Bobwhites lay 12-16 eggs in a shallow nest in a grassy or brushy area which hatch in about 23 days. Dove hunters in this region have fairly successful hunts, especially those that hunt over water. Generally, mourning dove numbers decline from east to west throughout the region. Many dove hunters are simply deer hunters working on their deer camps during Labor Day weekend. They carry their shotguns to the pastures in the evenings, knowing full well they won't limit-out. Nonetheless, it is another opportunity to get outdoors to appreciate nature. Another upland game species in the Trans Pecos is turkey. Both Rio Grande and Merriams occur in the Trans Pecos. While they share some of the habitat needs of bobwhites, turkey often are able to adapt to adverse conditions. The recent droughts have negatively affected nesting success and poult production; however, trend data indicates that turkey will likely rebound during good years. To learn more about wild turkeys in West Texas click on the photo above.